Experts in the UK are smoking mad over a lack of regulation surrounding food additives which may be leading to increased rates of cancer in people who eat processed meats. Meat has had a mighty difficult go of things since a concerning 2015 World Health Organization report which reclassified processed meats as Group 1, carcinogenic to humans. The news that your crispy bacon might be causing cancer was met with mixed reactions. But scientists in the UK are now suggesting there may be a way to have your bacon and eat it too. Part of the problem may center around the meat industry’s use of nitrites as preservatives. Nitrites are used as both a preservative and color fixture, ensuring meat has a pinkish hue, according to the Food and Drug Administration (FDA). 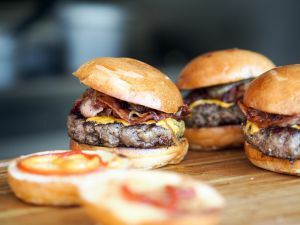 A coalition led by Queen’s University professor Chris Elliott claims there is a “consensus of scientific opinion” that adding nitrites to cure meats can cause an increased risk of cancer in humans and leading to 6,600 cases of bowl cancer in the UK. Coalition members, like cardiologist Dr. Aseem Malhotra, are calling upon the UK government to stop the use of nitrites are preservatives. “Government action to remove nitrites from processed meats should not be far away. Nor can a day of reckoning for those who dispute the incontrovertible facts. The meat industry must act fast, act now – or be condemned to a similar reputational blow to that dealt to tobacco,” Malhotra said to The Guardian. In the United States, nitrites are considered to be a safe food additive by the FDA and the Centers for Disease Control and Prevention has established guidelines on the recommended limit for nitrite and sodium nitrite additives. “To meat or not to meat” may be a question one has to decide for one’s own self. Thankfully, we may be about to get many more plant-based meat alternatives that seem almost like the real thing, even as debates rage whether plant-based alternatives should be allowed to be called meat.